Hi! My name is Sarah and I’m the founder of Lucky Penny Bread! Thank you so much for visiting our site and taking a look at what we have to offer. My start in baking was atypical. Since my family didn’t have a lot of money for college tuition, I followed the lead of my father, a career army soldier, and joined the military (read more here!). I was honorably discharged as a sergeant after five years stationed in San Antonio, Texas, as a Spanish linguist. After serving, I had to make a big decision about my future and after a little nudge from my best friend of over 20 years, I made a huge leap of faith and attended culinary school on the GI Bill. After graduation, I landed my first industry job at Frances’s pastry station, working for chef-owner Melissa Perello. Working for Melissa has been one of the greatest privileges of my life. When she tapped me to become the pastry chef, I readily accepted and dove headfirst into the role. 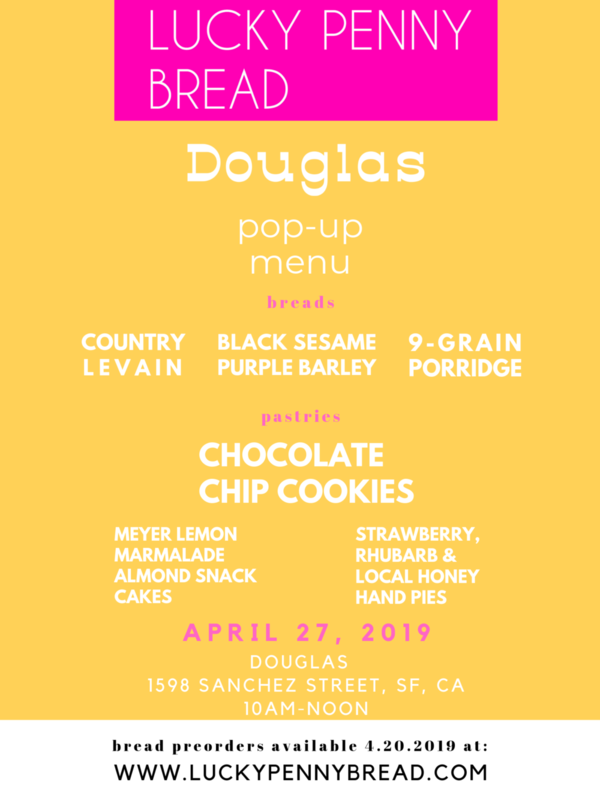 In 2015, when Melissa opened her second restaurant, Octavia in Pacific Heights, I developed the pastry department and eventually the bread program that still thrives today. Lucky Penny Bread was conceived after the birth of my daughter, Penelope, in early 2018. I wanted to find a way to connect with my community over my love of bread and still be able to be present in her day to day life. Using only quality grains and flours from local suppliers is the backbone of our bread and each loaf is lovingly mixed by hand. I hope that by instilling the love I have for the craft in each loaf and pastry, that I can forge friendships and lasting connections with my new neighborhood here in Terra Linda, California. Want to be the first to know about our upcoming bake sales? Sign up with your email address to receive news and updates about upcoming bake sales and events!